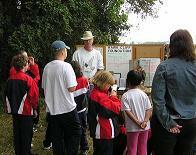 For the last few years, the HCF has worked hard to provide an onsite education program for visitors. This work wouldn't be possible without the efforts of many of our volunteers, including several individuals from the Hawk Cliff Banders Association and the St. Thomas Field Naturalists. We also need to thank our "Sponsors" for their help in providing funding for this program. For the Fall 2008 season we received funding from the following sponsor(s) (Click on the sponsor image to go to their website). 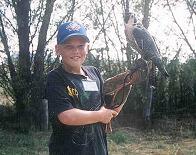 The Hawk Cliff hawkwatch is a great location for visitors to come to learn about raptors and their migration. We cater to school groups, and will arrange to provide special live bird demos for the kids (if possible) depending on the day's flight. The program includes a full-time interpreter (when available) to help answer visitor questions and to aid in identification of the migrating raptors. 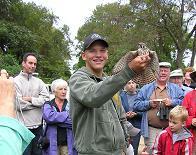 During the two main Hawk Cliff Weekends in mid September there are live bird demonstrations with informational talks. These demos are put on by the Hawk Cliff Banders Association with assistance from the St. Thomas Field Naturalists. You can find more details on our " Events" page. 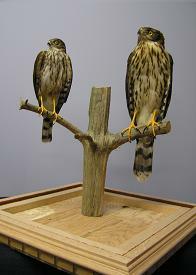 At the hawkwatch you'll see our new static raptor display which includes several different species including a male American Kestrel (at right) and a great comparison of immature Sharpie and Cooper's Hawk (at bottom right). 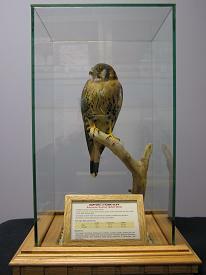 These displays serve as an excellent educational tool for explaining raptor id tips to visitors. There's also a booth that has pamphlets, handouts, raptor field guides, and a count display board that shows daily, monthly and year-to-date raptor counts. Many of our volunteers also spend time mentoring some of the keener youngsters that frequent the hawkwatch. In turn, these young people have the chance to become volunteers in their own right, helping to band raptors and attending programs like the Young Ornithologists Workshops sponsored by Bird Studies Canada and the Long Point Bird Observatory.